Positive sibling relationships are a boon for any human being, child, young person or adult. For most of us they are the longest relationships we will ever have. For children and young people who are in the care system they can be vital. Much research has been conducted demonstrating the long term emotional damage that may occur if siblings are separated. When our girls were separated from their sisters both adoptive families did everything they could to ensure their relationships continued. Legally we had to ensure the girls met up once a month. In reality we did much, much more. We had frequent meet ups, at both homes, at our beach hut, days out, and lots of sleep overs, as well as telephone and letter contact. Between all the adults we ensured that the girls strengthened their sibling bonds. Despite our best efforts this dramatically changed for the worse when the eldest girl returned to foster care. We had to battle to see her to give her Christmas presents. It took 3 months to get the foster carer’s telephone number. After 6 months of asking for the address we’ve just been told we’re not going to be given it as the foster carer doesn’t want us to have it. No effort at all was made by our girls’ sister’s Social Worker or foster carer to ensure meet ups were regular. We had to insist they happened. Everytime we asked the foster carer about them she referred us to the Social Worker. He never replied to us. At one point the foster carer was happy for the girls not to see each other for 7 weeks. We protested. We said the girls had to meet up every month. She ignored us. The Social Worker continued to ignore our e mails. The girls’ therapist e mailed the Social Worker twice. She was ignored as well. Our Adoption Support Social Worker tried to intervene to support the girls. She was eventually told to back off. Our girls’ sister told us and the foster carer she wanted to come to us for a little birthday party with her sisters. Neither foster carer nor Social Worker did anything to organise a taxi for her to get here. We asked again for this to be done. Nothing happened. We e mailed a social work manager, who replied that they had decided we would have to meet at a bowling alley instead. No reason was given. We protested. A lot. We e mailed senior managers repeatedly and asked our MP for help. In the middle of all this a new Adoption Support Social Worker was allocated, and we asked her to contact our girls’ sister’s Social Worker. Incredibly she had to ask her managers if she could, and perhaps more incredibly they advised her she could not. It was not until our girls’ therapist – a Clinical Psychologist – emailed senior managers, pointing out she had twice e mailed the SW about sibling contact and twice been ignored, that they changed their mind. So our girl’s sister came for her little birthday party, but a support worker – who she had never met before – was also sent. Why? A manager told us it was so that if our girl’s sister was anxious she would have someone to speak to! We have established relationships with both our girls’ sisters. If they need to say something, they’ll tell us. If they are anxious we’ll recognise the signs. We made the support worker feel at home, and we reassured our girls that she was not a threat. Obviously they had some trouble understanding why a total stranger was in their home just because their big sister was here. Bubble clung onto us, physically at times. And Squeak ramped up her controlling behaviour. Why were the sisters put through this? And why did we have to fight just to put on a birthday party in our home, the very place all the sisters had wanted it to be? UK legislation makes clear the importance of sibling contact. But it still comes down to the knowledge, skills, values and crucially the willingness of the individual Social Workers and foster carers to ensure the right things are done. Despite the potentially disasterous long term impact poor practice can have on children (and the short term stress for their parents) Childrens Services managers seem happy for this poor practice to continue. We can complain to the LA (we have done), and go to HCPC about individual Social Workers (we’re considering this), but by that stage the damage is done. Wouldn’t it be healthier and better for our children if Childrens Services listened, understood and worked in partnership with us to get it right at the beginning? We want to ensure our children have the best possible chance to recover from early trauma, and grow into physically and emotionally healthy adults. Why don’t our Local Authority’s Childrens Services want this too? Social media is a powerful tool. If you are an adoptee, care leaver, adoptive parent, Special Guardian, foster carer, Social Worker, manager, Therapist, Trainer, or have any other interest in promoting the welfare of siblings in care please tweet why this matters to you. Use the hashtag #SiblingsInCare . Maybe, just maybe it will help inform and improve social work practice. Hello, and thank you for visiting my blog, in which I hope to share the joys and challenges of our adoption journey with our two little girls, Bubble and Squeak. 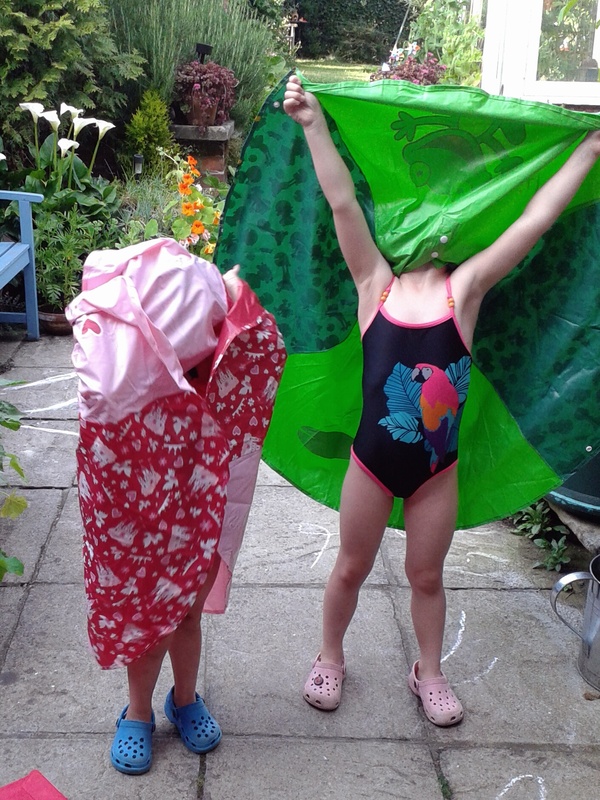 More soon, meantime here’s our lovely girls trying out their ‘sunny-rainy day’ ponchos.